We are sad to report that another greyhound has passed on to the Rainbow Bridge. We got word that EZ lost his battle with seizures. Beryl Powers adopted EZ from our group in August 2008. At the time he was on Craiger’s List because he was a seizure dog. He had seizures at the racing kennel so he was sent out for adoption. Beryl and her husband (now deceased) had no problem adopting EZ and they were more than willing to take care of him and give him a wonderful home. Over the years EZ had seizures on and off and Beryl each time took him to a neurologist for tests and medication adjustments. He did very well in her care. 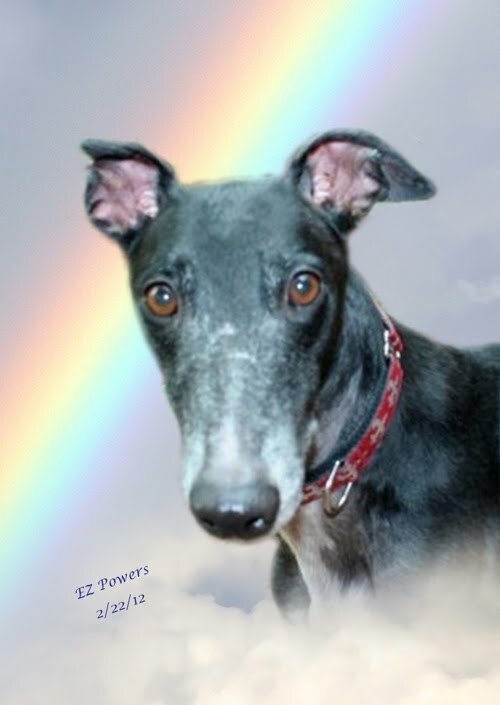 We are so sorry to learn that EZ is gone but we do know that without this special care EZ probably would never have enjoyed the number of years that he had. He was a sweet sweet boy and a big boy too. He loved raw carrots – they were his favorite treat. Beryl makes all of the coats we sell in our Greytdogs Store. She has been a loyal and generous volunteer and has made many items for our group including belly bands, pillows, blankets, etc. She has donated many items to our fund raising efforts. EZ is romping at the bridge with all of his companions and will never have a seizure again.